Lafayette Ceiling Tiles is rated 4.9 out of 5 by 18. 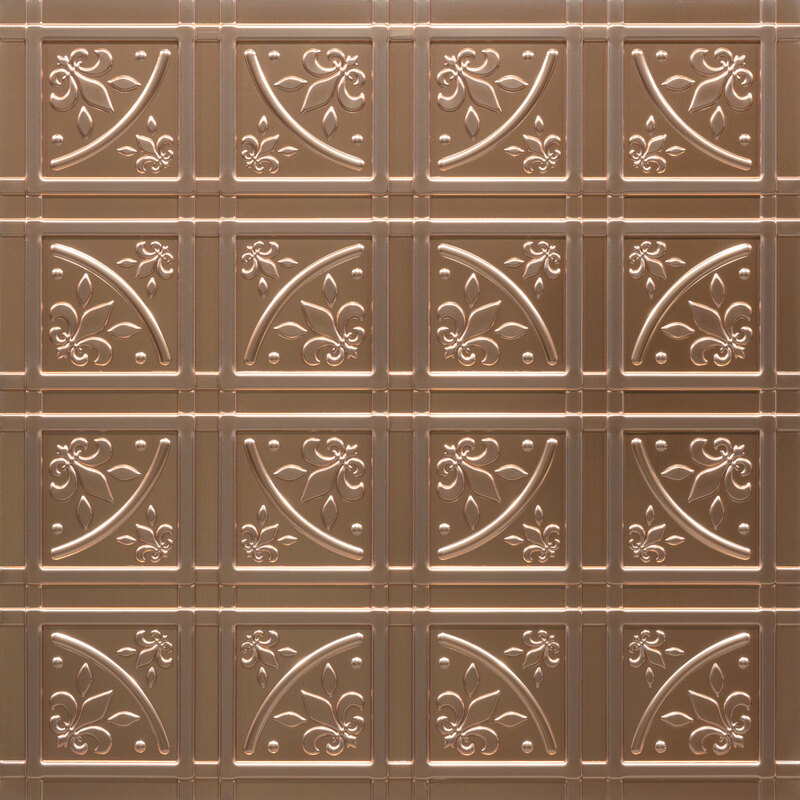 Lafayette Ceiling Tiles combine traditional American styling with ingenious American engineering. Made from our Signature Series 0.030 in. thick vinyl plastic and designed exclusively for glue-up applications (ceilings and walls), Lafayette's unique overlapping edge features make them simple to align and require no extra parts (strips or tape) to cover the seams. Rated 5 out of 5 by Jo112 from Looks AMAZING on the ceiling! I was looking for something to give my bathroom a "spark". These didn't disappoint. My suggestions: I would use a pencil to mark the area on the ceiling before you actually cut and place. It helped me to visually "see" where the tile would be placed. As far as cutting, I used a heavy duty pair of kitchen shears. You could also use a straight edge. For a 14 x 8 space, it took me about 6 hours from prep to cleanup. The adhesive is bit runny so you need to hold the tile up for 5-8 minutes to get it to adhere and not move. Final result was nothing short of amazing. My sister, who is a interior designer, couldn't believe the change in the room. I plan to do a gold tile above our dining room. This product works! Rated 5 out of 5 by Tbender from Lafayette Ceiling Tiles I’m a beginner in the world of DIY. I used these beautiful tiles on my bathroom ceiling. They are fairly large compared to other tiles I had. A flexible, sturdy vinyl that appears to be simple to clean. Ceilume.com has great information on their home site. The edges overlap each other for a seamless fit. No tape required. The tile cut easily and the glue held great ! Installing was simple. It changed the look of my room completely, giving it depth and style. Rated 5 out of 5 by GG13 from Perfect for what I needed! I received the Lafayette Ceiling Tiles in exchange for leaving a review. We had a leak in our roof which messed up the ceiling in one of our bedrooms. After replacing the damaged part of the ceiling, I wondered what in the world we would could use to hide the patch job in the ceiling. Well these were perfect for covering the difference and adding some style to the ceiling. Rated 5 out of 5 by Tammylu from Beautiful detail & love the large tiles! I had recieved 2 boxes a total of 12 tiles after I was done with my project I had 1 piece left and a bunch of small pieces. I did not use for the ceiling i decided to give this product a try on my wall. I must say it was very easy at first, the cuts were a bit more difficult but I think I did a great job with no help. These tiles are plastic are very big and pretty easy to cut. It was a bit harder around corner cuts as I really tried to match up pattern nicely I did manage to match up after several hours, this was about a total of 8 hours. I do like DIY projects and have a bit of experiece but not much. The adhesive held these nicely but would sometimes slide down a little every now and then so I just refixed it and it seems to be holding up well. I love the pattern and color was looking for a backsplash for my kitchen and this did very well. It makes my home stylish and modern. I would definately recommend to others. Rated 5 out of 5 by Meanie Karla from Beautiful Modern look tiles These tiles transformed my half bathroom's ugly an plain ceiling, it gave it a modern look, these are so easy to install and the little bit of flexibility in these makes them easier to get into place in the grid compared to the old style tiles, They simply look beautiful and they are not extremely glossy, have received many compliments, will definitely recommend. Rated 5 out of 5 by Redwing99999 from Ceilume Ceiling Tiles Great Design Beautiful !! I love these tiles. I used them as a backsplash in my kitchen and they look great. Really easy to apply as well. Did not have to do much cutting they fit right into place. Just love the design and color. Did not take no time at all installing them. I will be complimented a lot on the great look they have . Going to get more and use on the bathroom ceiling. Rated 5 out of 5 by peachy from Great 2" x 2" tile What a wonderful bronze color!!! These ceiling tiles are almost 2 feet by 2 feet! I am going to use them as a back slash. Those are glue-up tiles for wall or ceiling. Easy to cut to proper size with a good pair of scissors. Just take your time to measure and make sure to cut correctly.I do love the bronze color and the imprint. So pretty. Rated 5 out of 5 by Moe Ditty from Great Versatile Product! I used the Ceilume Ceiling tiles as the backsplash on my kitchen counter. It was incredibly easy to cut and install, which was a real asset as nothing in my house is square. They look great and are so easy to keep clean! Really added some pizzazz to my kitchen!